Those are gills of a juvenile southern spreadwing damselfly. 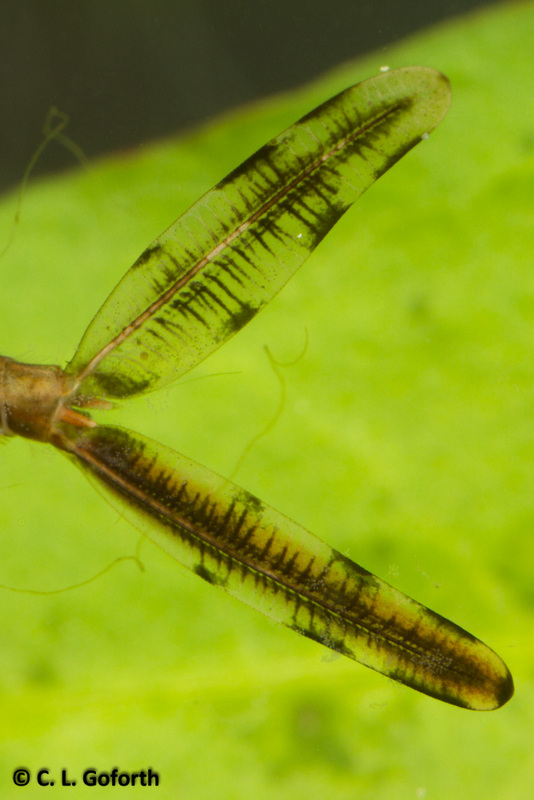 A lot of people don’t know that dragonflies and damselflies actually spend most of their lives underwater as nymphs. In fact, some dragonflies spend up to three years as nymphs, and then 4-5 weeks as adults on land. As nymphs, damselflies get everything they need from their aquatic habitat, a pond in this case. They eat small animals as prey, use cattails and other vegetation as shelter, and they get the oxygen they need from dissolved oxygen in the water. The gills of damselflies help them breathe by improving their ability to absorb oxygen through their exoskeletons. The gills massively expand the surface area of their exoskeleton, essentially adding another quarter or third of an exoskeleton to their bodies through which they can breathe. The gills also improve their swimming, the way wearing flippers while snorkeling can help people swim. However, damselflies lose gills all the time too. The one in the photo above only had two of the three it should have when I saw it in the water. Damselfly nymphs will sometimes fight each other and lose a gills. Sometimes a predator will try to eat a nymph and get a mouthful of loose gills while the damselfly swims away. While the gills do improve the lives of the damselflies and one missing its gills has a harder time getting oxygen or avoiding predators, they can survive with no gills at all. I love the way damselfly gills look! Another fascinating textured surface, compliments of insects. So glad I could share something interesting for you!